INTRODUCTION: Drinking waters usually contain several natural radionuclides: tritium, radon, radium, uranium isotopes, etc. Their concentrations vary widely since they depend on the nature of the aquifer, namely, the prevailing lithology and whether there is air in it or not. AIMS: In this work a broad overview of the radioactivity in drinking water is presented: national and international regulations, for limiting the presence of radioactivity in waters intended for human consumption; results of extensive campaigns for monitoring radioactivity in drinking waters, including mineral bottled waters, carried out throughout the world in recent years; a draft of guidelines for the planning of campaigns to measure radioactivity in drinking water proposed by the Environmental Protection Agency (ARPA) of Lombardia. Key words: radioactivity, drinking water, water quality, public health. INTRODUZIONE: L'acqua potabile contiene normalmente molti radionuclidi naturali: trizio, radon, isotopi del radio e dell'uranio, ecc. La loro concentrazione è molto variabile perché dipende dalla natura dell'acquifero, dalla presenza di aria in esso e dalla litologia prevalente. SCOPI: In questo lavoro è presentata un'ampia rassegna sul tema della radioattività nelle acque potabili: le norme nazionali e internazionali per limitare la presenza di radioattività nell'acqua destinata al consumo umano; i risultati di estese campagne di monitoraggio nelle acque potabili, comprese le acque minerali imbottigliate, condotte nel mondo negli ultimi anni; una proposta di linea guida per la pianificazione di campagne di misura della radioattività nell'acqua potabile elaborata dall'Agenzia Regionale di Protezione Ambientale (ARPA) della Lombardia. Parole chiave: radioattività, acqua potabile, qualità dell'acqua, sanità pubblica. Radionuclides of natural origin are normally present in different amounts in drinking water. They are released from rocks and minerals which form the aquifer as happens with other cations and anions: processes of erosion and dissolution bring radioactive elements from rocks into the water . Some common natural radioelements are those from the uranium-238 chain, a natural radioactive series of many radionuclides, one descending from the other. The most relevant are uranium-238 (238U), uranium-234 (234U), radium-226 (226Ra) and radon-222 (222Rn). Relatively abundant in the earth crust, 238U (around 3 mg/kg) and its descendant 234U, are often the most abundant radionuclides in water. The occurrence of (222Rn) may be important too; indeed, because of its moderate solubility in water, it rises mostly by emanation from inner soil layers rather than from the decay of the dissolved parent (226Ra). In spite of the fact that the activity concentration of 222Rn in freshly drawn water may be more than two orders higher than that of other radionuclides, it readily diminishes as a result of both desorption and physical decay. Another crucial radioactive family is the thorium232 series. Thorium is 3-4 times more abundant than uranium in the earth's crust, but owing to its poor solubility it scarcely occurs in waters. Radium-228 (228Ra) belongs into this series and it may become a critical contaminant, as its radiotoxicity is relatively high. Potassium-40 (40K or K-40) is also a widespread radionuclide. It is a beta-gamma emitter of primordial origin and goes along stable potassium in a fixed ratio (31.3 Bq per gram of stable potassium). Tritium (3H, H-3 or T) is a cosmogenic radionuclide; it is a hydrogen isotope formed in the high atmosphere. It occurs in rainfalls as tritiated water (HTO) at a concentration of roughly 5 Bq/l. It can be also produced by anthropogenic activities (research and nuclear facilities). It can reach the aquifers along their recharge process, but its concentration progressively decreases due to its relatively short decay time (t1/2 = 13 years). Tritium has a low radiotoxicity. In fact its dose coefficient is three orders of magnitude lower than the coefficients of the natural chain radionuclides . Besides natural radioactivity, exposed water reservoirs can be contaminated by artificial radionuclides (i.e. rivers and lakes by radioactive fallout caused by accidents or nuclear explosions) and for these reasons, allowed levels of artificial radionuclides in case of emergency have been set. A recent example is drinking waters in Tokyo during the Fukushima accident . In routine situations, reference levels  chosen to give a non-significant dose to the population  are set much lower than emergency levels. There is also contamination by natural radionuclides caused by human activity, where those radionuclides have been concentrated by non-nuclear industrial processes (e.g. mining, coal combustion, fertilizer production, etc.). - radionuclide concentration is higher in ground water than in surface water. Many national and international institutions have published rules  mandatory or not  that carry the intent of managing the question of radioactivity in drinking water. A short review of the most significant ones is hereby presented. WHO guidelines for drinking water suggest performing an indirect evaluation of individual dose criterion (IDC) of 0.1 mSv/y by measuring gross alpha and beta radioactivity and checking compliance of radionuclide activity concentration to derived guidance levels . - the outcome of this further evaluation may indicate that no action is required or that further evaluation is necessary before a decision can be made on the need for measures to reduce the dose. A specific guidance level is indicated for uranium. In fact, "The provisional guidance value for total content of uranium in drinking water is 30 µg/l based on its chemical toxicity, which is predominant compared with its radiological toxicity" . Concern about the total content of radionuclides in drinking water was brought to public attention by Council Directive 98/83/EC on the quality of water intended for human consumption. The directive requires Member States to monitor the concentrations of radionuclides in public drinking water  and sets parametric values of 100 Bq/l and 0.1 mSv/y for tritium activity concentration and total indica-tive dose (TID), respectively. The Directive sets out that TID must be evaluated excluding tritium, 40K, 14C, (222Rn) and its decay products, but including all other natural series radionuclides. 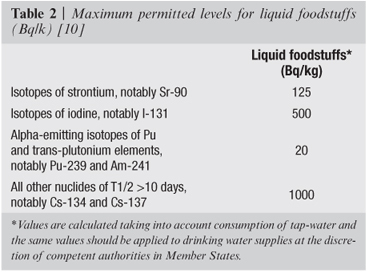 The Directive also reports an important note (Note 10 of radioactivity Table in ): "A Member State is not required to monitor drinking water for tritium or radioactivity to establish total indicative dose where it is satisfied that, on the basis of other monitoring carried out, the levels of tritium and of the calculated total indicative dose are well below the parametric value. In that case, it shall communicate the grounds for its decision to the Commission, including the results of this other monitoring carried out". For example, when it is well known that a possible source of tritium is not present in the area of interest, monitoring of this radionuclide is not needed. In 2001 this Directive was transposed into national law in Italy . It is important to point out that neither Directive 98/83/EC nor the Legislative Decree (DL.vo 31/01) which transposes it in Italy apply to all bottled waters other than mineral waters. The increasing use of mineral waters can pose radiation protection problems as they are generally richer in natural radioactivity than tap water is, but many people perceive and consume them as if they were tap water (e.g. to prepare baby/infant formula milk). For this reason mineral waters have been monitored in some Italian Regions (see par. on monitoring campaign). Tritium determination follows a well-established procedure, standardized by the International Standard Organization . Conversely, total indicative dose evaluation requires more specific and cumbersome procedures for the measurement of the radioactivity content, with special regard to natural series radionuclides. The large number of possibly involved radionuclides and the high sensitivities required make the application of traditional analytical techniques unsuitable for large scale monitoring programs. Maximum concentration values for radon and its decay products, out of the application field of the directive, were separately proposed in Commission Recommendation 2001/928/Euratom . It is worthwhile remembering that the reference values for 222Rn and its short life decay products are not mandatory. Table 1 shows a summary of the European regulations. On 17 April 2012, a new Council Directive "laying down requirements for the protection of the health of the general public with regard to radioactive substances in water intended for human consumption" was submitted to the European Parliament for final approval . This new regulation introduces important novelties with respect to Directive 98/83/EC , namely; 1) it regulates Rn and its decay products; 2) it reports general principles and monitoring frequencies for water, and screening levels for gross alpha and beta activities; 3) it explains the method of TID calculation; 4) it provides a list of the activity concentrations of the most common natural and artificial radionuclides to comply with a TID of 0.1 mSv per year; 5) for said radionuclides, it provides requirements on detection limits of the analytical methods utilised. After the Chernobyl accident, the European Union set maximum permitted levels of radioactive contamination of foodstuffs in case of a radiological emergency. Maximum reference levels were proposed separately for alpha-emitting artificial radionuclides and beta-and/or gamma-emitting artificial radionuclides in drinking water . These values will be in force in any case of an emergency situation (Table 2). Special legislations have been issued to regulate import from Japan in the aftermath of the Fukushima accident. These official initiatives of the European Commission [11, 12] were necessary to align the EU levels with the significantly lower Japanese ones, estimated to determine 5 mSv/y (1 mSv/y from drinking water). One year after the accident, Japanese authorities reduced the dose goal to 1 mSv/y (0.2 mSv/y from drinking water); consequently, the European Commission issued a new regulation . Table 3 reports levels for liquid foodstuffs. is automatically enforced (see Table 2). Secondly, the total amount of Japanese liquid foodstuffs to be assimilated to drinking water and imported into the European Union is actually small (around 2% of food imports); which means that the adoption of levels well below those which would be applied in EU in case of radiological emergency does not determine a significant problem of import and marketing. Finally, from a radiation protection point of view, in the authors' opinion, Japan's conservative maximum levels should kindle the revision of the EU emergency maximum levels in foodstuffs. In 2000 the US Environmental Protection Agency  published the final rule about radionuclides in drinking water. In this regulation, maximum contaminant level goals (MCLGs), maximum contaminant levels (MCLs), and monitoring, reporting, and public notification requirements for radionuclides are given. The rule is only applicable to community water systems. MCLGs (non-enforceable healthbased targets) are zero for all radionuclides, based on the no-threshold cancer risk model for ionizing radiation. The other requirements are summarised in Table 4. 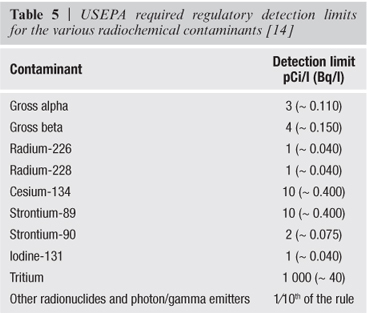 The regulation also reports requirements for the detection limits of all radionuclides, and indicates the best measurement techniques (see Table 5). From the beginning of the '80s, wide monitoring campaigns for assessing the natural radioactivity in drinking waters have been run in United States [15-18]. Results have been summarized by J. Longtin . Mostly uranium isotopes, 226Ra, 228Ra, and 222Rn were measured. Subsequently extensive studies have been performed both on ground waters feeding public water resources [19-22], and on spring or bottled mineral waters [23-31]. Many other studies are available, including reports by national authorities [32-34]. In Italy the first papers on radioactivity in waters were published starting from the '60s [35, 36]. One or two decades later extensive studies were done mainly by the Milano University team [37-44]. Afterwards, public agencies for environmental monitoring started the surveillance of water resources [45-47]. In the meantime systematic campaigns for assessing levels of radon in waters started as well . Since 1996 the Environmental Protection Agency of Lombardia (ARPA Lombardia) has performed detailed studies on radioactivity in both mineral and tap waters [49-55]. Radiometric data on drinking waters are available for central Italy too [56-61]. Worldwide survey results show a wide variability in the absolute concentrations of natural radionuclides (which usually follow a lognormal distribution). 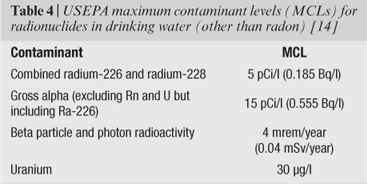 If freshly drawn tap water is considered, the highest radioactivity concentration is generally due to 222Rn, which is 2-3 orders higher than for other radionuclides. Nevertheless, due to both ease of desorption and physical decay, its concentration rapidly decreases and is significantly lower if sampling is made at the delivery point (in-house water tap) or negligible in bottled water. If the total exposure due to drinking water is calculated, 222Rn can be generally responsible of the largest dose fraction, mainly by the inhalation pathway . Among non-volatile radionuclides (thus excluding 222Rn), the uranium isotopes often show the highest activity concentrations but, given their relatively low conversion factor, their contribution to the total dose is low . The highest dose fraction is often attributable to radium isotopes (226Ra and 228Ra), especially when lower age classes are taken into account. In some cases the major contribution is due to 210Pb and 210Po [33, 34]. Crucial for radioprotection, the problem of radium contamination has been widely examined. The presence of radium isotopes in groundwater is highly variable; the concentrations of 226Ra, and sometimes those of 228Ra, may exceed 1 Bq/l, but in most cases they are associated with thermal springs, mineral water or drilled wells. Very few examples are found of aqueducts contaminated by radium . In Finland many investigations have been carried out even in recent times [32, 64]. The problem of radium concerns only private wells and to a limited extent: 4% of the examined wells exceeded 500 mBq/l of 226Ra and 1% exceeded 200 mBq/l of 228Ra concentration. In Sweden  a considerable number of private drilled wells (47%) exceeds the national limit (185 mBq/l for total radium). Measurements carried out in Western Spain  showed that in 13% of drilled wells 226Ra exceeded 1 Bq/l, with a maximum value of 9.3 Bq/l, but dug wells exhibited much lower radium levels. In Extremadura, close to Portugal, small aqueducts carry water with 226Ra content up to 720 mBq/l and mitigation processes have been considered . Radium monitoring in water resources has been accomplished in many other countries [33, 51, 68-74]. Interesting cases are found in Middle East. In some dry areas in the south of Israel , the wide Nubian sandstone aquifer produces water with radium activities exceeding national regulation limits, which are in substantial agreement with WHO screening criteria. In any case, in such dry areas there are few alternative resources. In southern Jordan, nearby the cited area, the possibility of exploitation of this fossil, non-renewable aquifer has been studied . Concentrations up to 1.3 Bq/l and 3.1 Bq/l for 226Ra and 228Ra, respectively, have been found with highly variable ratios. As for the USA, nearly 80% of the 60 000 water supplies in the country use ground water sources, and 90% of them serve less than 3300 people. In general radium was found to be a problem for some small aqueducts. A screening level of 185 mBq/l for gross alpha activity and 110 mBq/l for 226Ra was used: non-compliances were found mainly in South-East coastal regions (New Jersey, North Carolina, South Carolina, Georgia) and in the North-Central regions (Minnesota, Iowa, Illinois, Missouri and Wisconsin) . Those non-compliances were mainly due to 226Ra and the average radium isotope concentration was 370 mBq/l. In South Carolina approximately 3% of the ground water supplies exceeded the 185 mBq/l value, reaching the values of 980 and 440 mBq/l for 226Ra and 228Ra, respectively. In Iowa radium concentrations up to 1.8 Bq/l (before treatment) were reported for a public water supply [63, 77]. As a consequence, a number of aqueducts adopted specific treatments for radium mitigation in drinking waters. If we consider the above literature data, radium levels comparable with derived levels (226Ra > 500 mBq/l or 228Ra > 200 mBq/l)  are seldom found in public water resources. Most cases are related to private drilled wells (especially in Scandinavia) and to mineral or thermal water, whose consumption is optional. In some areas (e.g. Australia) local uranium mining may cause water contamination but it does not concern drinking water resources. Aqueducts using ground water normally exhibit low radium levels even in areas whose prevailing geology is supposed to be favourable to the radiological contamination of waters. Situations in which radium levels are high and water treatment is necessary for Ra removal are spatially limited exceptions. One remarkable example is Estonia, where aqueducts in the North are fed by aquifers very rich in radium isotopes [78-80]. This gave rise to a high number of non-compliances with the national regulation, since Estonia national law adopted a TID value of 0.1 mSv/year  as a limit. The highest radium concentrations are known to be found in the oldest and deepest Estonian aquifer , the Cambrian-Vendian (Cm-V). This aquifer becomes shallower in northern Estonia, close to the coastal area, where it is widely used as a drinking water reservoir. Being the most populated area as well, the radioprotection concern involves a high percentage (22%) of the Estonian population, roughly estimated in 250 000 people . This recent study shows that doses to the younger population often exceed the value of 1 mSv/year in, up to 12 mSv/year. The potential impact on human health drove the European Commission to establish a cooperation agreement between Italy and Estonia in order to better understand the situation and implement remedial actions . While waiting for the new, more detailed EU directive , in the Annex a draft of guidelines for the planning of campaigns to measure radioactivity in drinking water proposed by ARPA Lombardia (Environmental Protection Agency of Lombardia)  is presented. The document was commissioned by ISPRA (National Institute for Environmental Protection and Research) in order compensate for the lack of measurement methodologies and protocols in DL.vo 31/01 and while waiting for the more detailed, new EU directive , and was prepared by ARPA Lombardia with the contribution, among others, of ARPA Emilia Romagna and the Italian National Institute of Health (Istituto Superiore di Sanità, ISS). The draft was presented in 2005 during the Annual Meeting of the Italian Network of Environmental Radioactivity Monitoring, but was never officially released. In these guidelines some indications for starting a survey are presented, which account for approaches already adopted by some international organizations  and discussions carried out in the European context . The authors wish to thank Monica Brocco (ISS) for the linguistic revision of the manuscript. 1. Ivanovich M, Harmon RS. Uranium-series disequilibrium. 2. ed. Oxford: Clarendon Press; 1992. 2. World Health Organization. Guidelines for drinking water quality. 4. ed. WHO: Geneva; 2011. 3. International Atomic Energy Agency (IAEA). Fukushima nuclear accident. Available from: www.iaea.org/newscenter/focus/fukushima. 4. Cothern CR, Rebers PA (Ed.s). Radon, radium and uranium in drinking water. Chelsea, Mich.: Lewis Publishers; 1990. 5. European Union. Council Directive 98/83/EC of 3 November 1998 on the quality of water intended for human consumption. Official Journal of the european Union L 330, 05/12/98. 6. Italia, Decreto Legislativo 2 febbraio 2001, n. 31. Attuazione della direttiva 98/83/CE relativa alla qualità delle acque destinate al consumo umano. Gazzetta Ufficiale n. 52 (Suppl. Ord. n. 419), 3 marzo 2001. 7. ISO. Water quality. Determination of tritium activity concentration  Liquid scintillation counting method. Geneva: International Organization for Standardization; 1989. 8. European Commission. Commission Recommendation of 20 December 2001 on the protection of the public against exposure to radon in drinking water supplies (2001/928/Euratom). Official Journal of the european Communities L 344, 28/12/2001. 9. European Commission. Proposal for a Council Directive laying down requirements for the protection of the health of the general public with regard to radioactive substances in water intended for human consumption. COM(2012) 147 final, 2012/0074 (NLE). Available from: http://eur-lex.europa.eu/LexUriServ/LexUriServ.do?uri=COM:2012:0147:FIN:EN:PDF. 10. European Union  EURATOM. Council Regulation no. 2218/89 of 18th 1989 amending Regulation nº 3954/87 laying down maximum radioactive contamination of foodstuffs following a nuclear accident or any other case of radiological emergency. Official Journal of the european Union L 3211, 22/07/89. 11. European Commission Implementing Regulation (EU) no. 297/2011 of 25 March 2011 imposing special conditions governing the import of feed and food originating in or consigned from Japan following the accident at the Fukushima nuclear power station. Official Journal L 80/5, 26/03/2011. 12. European Commission implementing Regulation (EU) no. 961/2011 of 27 September 2011 imposing special conditions governing the import of feed and food originating in or consigned from Japan following the accident at the Fukushima nuclear power station and repealing Regulation (EU) no. 297/2011. Official Journal of the european Union L 252/10, 28/9/2011. 13. European Commission. Implementing Regulation (EU) no. 284/2012 of 29 March 2012 imposing special conditions governing the import of feed and food originating in or consigned from Japan following the accident at the Fukushima nuclear power station and repealing Implementing Regulation (EU) No 961/2011. Official Journal of the european Union L 92/16, 29/03/2012. 14. United States Environmental Protection Agency. National primary drinking water regulations; radionuclides; rinal rule. Part II. 40 CFR Parts 9, 141, and 142. Washington DC: USEPA; 2000. 17. Cothern CR, Lappenbush WL. Dinking water contribution to natural background radiation. Health Phys 1986;50:33-47. 19. Salonen L. Natural radionuclides in ground water in Finland. Radiat Prot Dosimetry 1988;24:163-6. 24. Rabergh CMI, Lilius H, Eriksson JE, Isomaa B, Duenas C, Fernandez MC, Carretero J, Liger E. Canete S. 226Ra and 222Rn concentrations and doses in bottled waters in Spain. J env Radioact 1999;45:283-90. 27. Obrikat D, Beyermann M, Bünger Th, Viertel H. Natural radionuclides in water in Germany. Kerntechnik 2004;69:1-4. 29. Schoenhofer F. Natural radionuclides in mineral waters sold in upper Silesia, Poland. Their measurement, doses and compliance with regulations. In: Eikenberg J, Jäggi M, Beer H, Baehrle H (Ed.). LSC 2008 Proceedings. Tucson: University of Arizona; 2009. 33. Institut de Radioprotection et de Surete Nucleaire. Analyse de la radioactivitè des eaux. Paris: IRSN; 2008. (Rapport DEI/STEME/LTE, n. 2008/05). 35. Cigna A, Talenti M. La radioattività naturale in alcune acque minerali italiane. Minerva Nucleare 1965;9:248-50. 36. Mastinu G. Le acque minerali italiane. In: Atti del 3º Convegno Internazionale sulle Acque Sotterranee. Palermo: 1975. 37. Facchini U, Ravasini G, Sgorbati G, De Crescenzo S. Misure di radioattività nelle acque minerali e nelle acque sorgive. In: Giornata di studio Acque per uso potabile. Milano: Gruppo Italiano di Studi e Ricerche; 1987. 38. Facchini U. Magnoni S. Dezzuto C. Cantadori M. Radon nelle acque di fonte nella pianura padana e in alcune vallate alpine. Acque Sotterranee 1993;25:38. 39. Facchini U, Magnoni S, Garavaglia S, Rinaldi F, Sordelli C. Livelli di radon-222 in un acquifero geotermico della pianura padana. Acque Sotterranee 1994;13:41. 40. Gorgoni C, Martinelli G, Sighinolfi GP, Facchini U, Morniroli E, Tamborini G. Contenuto di radon-222 in acque sotterranee della pianura padana. Acqua e Aria 1981;439:4. 41. Maddalena M, Magnoni S. Misure di radioattività naturale in acque sotterranee. Acque Sotterranee 1993;33:39. 42. D'Alessio D, Morlotti R, Ravasini G. Misura del livello di radon in acque di pozzo e in sorgenti lungo la costa lombarda del Lago Maggiore. Acqua e Aria 1985;287:3. 43. Colombo E, Garavaglia M, Genchi S, Maddalena M, Magnoni S. Sorgenti radioattive in Valtellina, nel biellese e in Garfagnana. Rendiconti Ist Lombardo Acc Di Scienze e Lettere 1994;149:128. 44. Magnoni S, Colombo R, Ghedini A. Misure di 226Ra e 222Rn in acque sorgive. Quaderni di geologia applicata 1995;1(Suppl.):153-62. 45. Giovani C, Achilli L, Agnesod G, Bellino L, Bonomi M, Cappai M, Cherubini G, Forte M, Garavaglia M, Maggiolo S, Magnoni M, Minach L, Risica S, Sansone A, Santamaria, Trotti F. Natural radioactivity in Italian drinking and mineral water: experimental data and dose assessment. In: Burkart W, Sohrabi M, Bayer A (Ed.). 5th International conference on high levels of natural radiation and radon areas proceedings. Amsterdam: Elsevier; 2002. 48. Minach L. Radon in Alto Adige  stato delle indagini. Available from: www.provincia.bz.it/agenzia-ambiente/radon/index_i.htm. 2003. 49. Sgorbati G, Gianforma G, Forte M, Ciglia S. Determinazione di radio e uranio nella acque minerali. In: Atti del I Congresso Internazionale Acque Minerali e Soft Drinks. Firenze: Industrie delle Bevande; 1996. 51. Forte M, Rusconi R, S. Bellinzona MT. Cazzaniga, Sgorbati G. A wide range monitoring of drinking water natural radioactivity in northern Italy. In: 11th International Congress of International Radiation Protection Association. (IRPA 2004 Proceedings) Madrid, Spain: 2004. 52. Forte M, Rusconi R, Cazzaniga MT, Sgorbati G. La radioattività nelle acque potabili lombarde: impostazione dei controlli. Acqua e Aria 2005;5:32-6. 60. Borio R, Rongoni A, Saetta D, Desideri D, Roselli C. Radon and tritium measurements in drinking waters in a region of central Italy (Umbria). J Radioanal Nucl Chem 2005; 266(3):397-403. 62. Risica S, Grande S. Coucil Directive 98/83/eC on the quality of water intednded for human cosumption: calculation of derived activity concentrations. Roma: Istituto Superiore di Sanità; 2000. (Rapporti ISTISAN, 00/16). 63. International Atomic Energy Agency. The environmental behaviour of radium. Vienna: IAEA; 1990. (Technical Report, STI/DOC/10/310). 65. Salih Isam MM, Pettersson HBL, Lund E. Uranium and thorium series radionuclides in drinking water from drilled bedrock wells: correlation to geology and bedrock radioactivity and dose estimation Radiat Prot Dosimetry 2002;102:249-58. 66. Fernandez F, Lozano JC, Gomes JMG. Natural radionuclides in western Spain. Radiat Prot Dosimetry 1992;45:227-9. 68. Ulbak K, Klinder O. Radium and radon in Danish drinking waters. Radiat Prot Dosimetry 1984;7:87-9. 71. Ahmed NK. Natural radioactivity of ground and drinking water in some areas of upper Egypt. Turkish J eng env Sci 2004;28:345-54. 72. Bronzovic M, Marovic G, Vrtar M. Public exposure to 226Ra in drinking water. Arh Hig Rada Toksikol 2006;57:39-44. 75. Koch J, Haquin G. A new approach in dealing with the radiological quality of drinking water. In: IRPA 12 Conference Proceedings. Buenos Aires: 2008. 79. Marandi A. Natural chemical composition of groundwater as a basis for groundwater management in the Cambrian-Vendian aquifer. Ph.D. Thesis. Tartu University; 2007. 83. ARPA Lombardia. Guideline for the planning of the campaigns of measurements of the radioactivity in drinking water. Annual Meeting of the Italian Network of Environmental Radioactivity Monitoring, 2005. 84. Radioactivity in european drinking water sources and designated for the production of drinking water, Web-based european Knowledge Network on Water, WeKNOW, 2005. Available from: www.weknow-waternetwork.com/uploads/booklets/04 _radioactivity_eu_drw_ver_juni2005.pdf. 85. Commissionof theEuropeanCommunities.Recommendation of 8 June 2000 concerning the monitoring of levels of radioactivity in the environment for the purpose of assessing the exposure of the population (2000/473/Euratom). Official Journal of the european Communities L 191, 27/7/2000. 86. Centro Tematico Nazionale Agenti Fisici (CTN-AGF). Rassegna nazionale delle iniziative di monitoraggio in tema di radon per la caratterizzazione del territorio. Roma: Agenzia per la Protezione dell'Ambiente e per i Servizi Tecnici; 2001. (AGF-T-RAP-01-10). 87. Minach L, Verdi L. Radon in South Tyrol. In: 5th International Conference on High Levels of Natural Radiation and Radon Areas Proceedings. Munich: 2000. 88. United States Environmental Protection Agency. Radionuclides notice of data availability technical support document, March 2000. Available from: www.epa.gov/safewater/rads/tsd.pdf. 89. ISO 9696. Water quality. Measurement of gross alpha activity in non-saline water. Thick source method. Geneva: International Organization for Standardization; 1992. 90. Ente Nazionale Italiano di Unificazione. Qualità dell'acqua. Determinazione del contenuto di attività alfa e beta totale in acque destinate al consumo umano mediante scintillazione liquida. Progetto di norma UNICEN 216. 91. ISO 9697. Water quality. Measurement of gross alpha activity in non-saline water. Geneva: International Organization for Standardization; 1992. Legislative Decree 31/01 (DL.vo 31/01) "Transposition of Directive 98/83/EC on water intended for human consumption" for the first time set the obligation to verify the content of natural and artificial radioactivity in water. The recommendation of the European Communities 2001/928/Euratom  considers the problem of population exposure to radon-222 and some of its decay products (lead210 and polonium-210) in drinking water, and aims to promote the implementation of representative surveys to establish the extent and nature of exposure to radon and its long-life decay products. The control of water is to be performed by both the waterworks (internal controls) and the local health authority (external controls). As for radiometric parameters, control planning should be defined by Regions, in accordance with the requirements of annex II of the DL.vo 31/01. However, neither Directive 98/83/EC  nor the DL.vo 31/01  have yet defined frequency, methods or criteria for the choice of control points. In any case, Italy has felt the need to undertake these controls, to be carried out by the Regional Environmental Protection Agencies (ARPA). For lack of specific guidelines, a useful tool can be the European Commission recommendation 2000/473/Euratom on the control of environmental radioactivity   which provides general guidance on planning criteria for environmental monitoring. At any rate, after some ARPAs first advanced the 2001 proposal to define ways of planning and conducting investigations on radioactivity in water intended for human consumption , this guideline intends to provide methods and criteria to plan measurements with specific reference to the parameters and values set out in Legislative Decree 31/01. Radon-222 measurement is not an explicit goal of this document, as this type of assessment is required neither by Legislative Decree 31/01 nor recommendation 2000/473/Euratom. As regards radioactivity in drinking water, DL.vo 31/01 requires the compliance with the limits of two parameters, i.e., the concentration of tritium (H-3) and the value of the total indicative dose, TID (Table A1). Tritium is a radionuclide of both natural and artificial origin. As already said, tritium is produced by the interaction of cosmic radiation with the upper atmosphere, enters the water cycle and is normally found in drinking water at concentrations of about some Bq/l. Sources of anthropogenic tritium are some types of research and nuclear facilities. TID depends on the amount of radiation absorbed by the body after the ingestion of radioactive substances contained in water; it is measured in mSv/year. The dose from ingestion is normally estimated by multiplying the values of radioactivity concentration in water by specific conversion coefficients that depend on the type of radioactive substance. Dose assessment requires the measurement of all the radioactive isotopes present in the water, excluding the contribution of tritium, potassium-40, radon-222 and its decay products. This method of investigation, however, is extremely costly because it requires a great amount of time and resources (the amounts of radioactivity to be searched for are very small, which requires the use of very sensitive analytical techniques). It is therefore not applicable to a large number of samples. In order to compensate for the lack of measurement methodologies and protocols in DL.vo 31/01  and while waiting for the more detailed, new EU directive  , some indications for starting a survey are presented, which account for approaches already adopted by some international organizations  and discussions held within the European context . In Italy numerous studies on the content of radon-222 in water, explicitly excluded from the scope of the DL.vo 31/01 , indicate that the concentration of this radionuclide is always less than 100 Bq/l [38, 47, 86, 87], with some exceptions in the pre-alpine and alpine areas. For some years now, periodic assessments of the artificial radionuclide contamination of drinking water are in place in several Regions. Unfortunately, such data are not sufficient to assess the parameters required by the DL.vo 31/01 because they are acquired by gamma spectrometry, a method which does not measure pure alpha-or beta-emitting radionuclides  in particular uranium and radioisotopes , and often shows insufficient analytical sensitivity. Surveys of radioactivity in waters, valid also for DL.vo 31/01 requirements, were carried out in Lombardy . Sporadic measurements of tritium were conducted in other Regions. Control surveys of radioactivity in water should be planned, accounting for the fact that the levels of radioactivity to be measured are very low: some mBq/l or fractions of mBq/l of strontium-90 and cesium-137, some Bq/l of tritium, from few mBq/l to a few hundred mBq/l for gross alpha and beta activity, and radium, uranium and thorium isotopes. Analytical methods must thus be higly sensitive, and turn out to be onerous in terms of time and human efforts. This is why radioactive control plans cannot match plans already in place to evaluate chemical and microbiological parameters, which surely have a higher number of samples per year. Moreover, since the most substantial contribution to total radioactivity in water is of natural origin (except in the case of accident or in the presence of important anthropogenic sources) [14, 88], the radioactivity content in water is unlikely to change significantly over time. The frequency of inspections, therefore, does not necessarily have to follow DL.vo 31/01 requirements for non-radiometric parameters. Furthermore, as already proposed in some international documents  and during discussions at the European level, a procedure to perform an initial screening of the gross alpha and beta activity concentration is hereby presented. This method is less complex and less costly than single radionuclide measurements, can be carried out on a large number of samples, and provides useful indications on the total radioactivity content of the water. The suggestions provided in this document about application times and procedures for measurement surveys are provisional, in waiting for the new European Union Directive  and its transposition into national law. 3. tritium, if any; the measurement of this parameter is required only in cases where there are human activities sources of tritium within the catchment basin of the aquifers used for drinking water. B) in-depth investigations to detect and quantify individual radionuclides in drinking water. This type of investigation needs particularly complex and expensive protocols of analysis, and is applicable to a limited number of samples. d. artificial radionuclides (gamma emitters, strontium-90 and plutonium isotopes), which must be investigated where local sources of anthropogenic pollution are known to be located. In this case the analysis should be carried out with sufficient analytical sensitivity. For example, when searching for gamma-emitter radionuclides by gamma spectrometry, it is normally necessary to preconcentrate sample volumes of at least some tens of litres. In order to improve the interpretation of analytical results it may be necessary to determine the concentration of potassium-40, which is normally estimated by measuring the chemical content of potassium and using the stable isotopic abundance in the natural mixture of potassium (27.6 Bq of beta activity per gram of total potassium ). The complete characterization of water would also require the measurement of radon-222, lead-210 and polonium-210 concentrations, even though DL.vo 31/01 explicitly excludes these parameters. A) screening investigations should be conducted at all main regional waterworks or collection points that supply water to a significant fraction of population. However, at least three points of investigation for each province should be identified and this kind of investigations should be carried at least in each regional capital. Sampling should be preferably performed in delivery points, i.e. taps normally used for human consumption; a sampling is also proposed for each "supply area" (as defined in Annex II of the DL.vo 31/01: "A supply area is a geographically defined area within which water intended for human consumption comes from one or more sources, and its quality may be considered substantially uniform"). In the presence of particularly complex aqueducts, with multiple distribution centres, it may be difficult to clearly identify supply areas; in this case it is suggested to run the sampling in one delivery point for each plant. c. in all cases in which the screening has shown levels of radioactivity exceeding one of the screening levels for the gross alpha or beta activity. In-depth investigations samplings should be preferably performed in the collection points (wells or catchment points of drinking water). Screening activities. The suggestion is to repeat the sampling campaign and the measurements at least twice, in order to evaluate the range of variability of the measured values. Controls can be then repeated on the basis of a regional program. By the way, significant changes in natural radioactivity content are sometimes observed in aqueducts fed by several supply wells when the contribution from the different wells changes. In these cases, it would be appropriate to repeat the sampling during the first year  with frequency from monthly to quarterly  in order to determine ranges of maximum fluctuation of the measured concentrations. - in the absence of well-known anthropogenic contamination phenomena. When the purpose of the in-depth investigation is to characterize waters from the radiometric point of view, it may be reasonably supposed that the radionuclides in water are of natural origin; if so their variability over time will not be significant. In this case, after the initial characterization, the need to repeat controls and their frequency should be assessed at the regional level. Tritium. Under the DL.vo 31/01, the tritium reference level is100 Bq/l. Screening activities. For gross alpha and beta activity, values of 0.1 Bq/l and 1 Bq/l are proposed, respectively. If one or both these values are exceeded it will be necessary to determine any single radionuclide content contributing to the total radioactivity content. In this case, the radionuclides that must actually be searched for will be defined accounting for all available information on possible local sources of natural and/or artificial radioactivity. 2. the member of public is an adult that consumes 730 l water per year . Concentration values are shown in the second column of Table A4 for some of the main natural and artificial radionuclides. In order to ensure compliance with the requirements of the European recommendation 200/473/Euratom, constant and periodic checking is proposed  at least every six months  of the water supplied by the main national waterworks, selected among those providing at least 108 liters of water per day (roughly equal to a catchment area of 500 000 inhabitants). Tables A3 and A4 show some of the methods that can be used for the measurement of radioactivity in water. The list is not exhaustive: rather it aims to give some guidance to laboratories when choosing the most suitable analytical method for their purposes. In order to orient this choice, suitable analytical methods allow to measure concentrations equal to or lower than the detection limits shown in the third column of Tables A3 and A4, i.e., approximately 1/10 of reference values given in the second column of the same tables. As regards uranium-238, it is important to note that the value in Table A3 was calculated only accounting for its radiological properties. The chemical toxicity has a reference value  proposed by WHO Guidelines   of 30 µg/l (ppb), corresponding to a U-238 concentration of 186 mBq/l (much lower than the reference value concerning radio-toxicity, 3 Bq/l). Therefore, as regards uranium, the most conservative value is the chemical toxicity guidance level. The value of 30 µg/l can be compared directly with the result obtained from the chemical analysis of uranium (e.g., fluorimetry or ICP-AS spectroscopy). However, if uranium is measured by radiometric methods and the activity of each radioisotope is quantified in Bq/l, it should be noted that natural uranium consists predominantly of U-238 in terms of mass; therefore compliance with 30 µg/l is verified if the concentration of uranium-238 is less than 186 mBq/l. It is also evident that, in terms of gross alpha activity, a U-238 concentration of 186 mBq/l results in at least twice as much alpha activity (at least 372 mBq/l), owing to the contribution of the alpha-emitter isotopes U-234 and U-235. Indeed, in the literature U-234 is known to be normally present in waters to an extent greater than or equal to that of U-238.